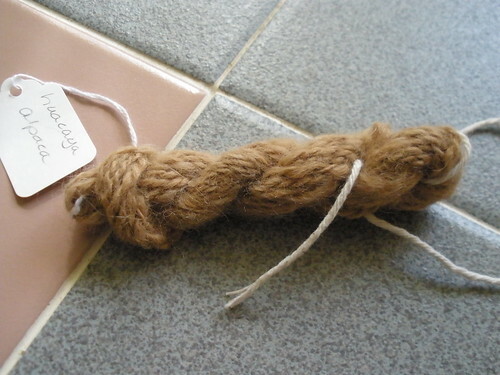 and Suri alpaca, both very soft. Buffalo down. Not very soft, really! There is extremely soft Buffalo down available, which is very expensive. 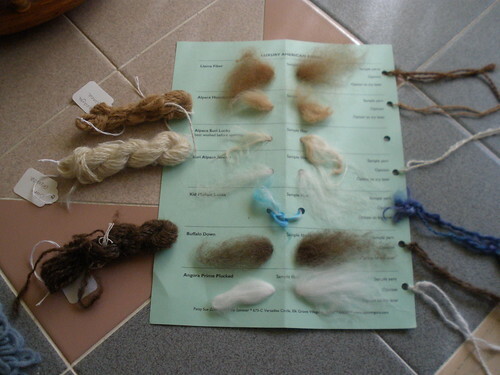 The coarser hairs are removed, leaving the soft, fluffy down. 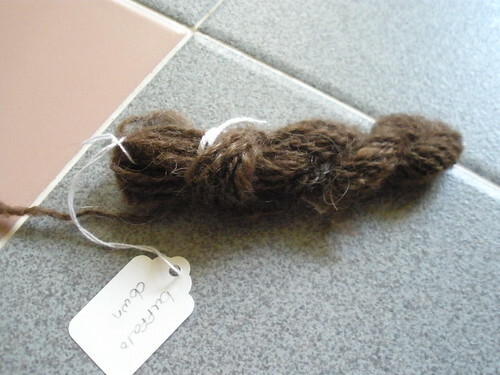 This sample is the complete fiber carded so it's a bit scratchy. 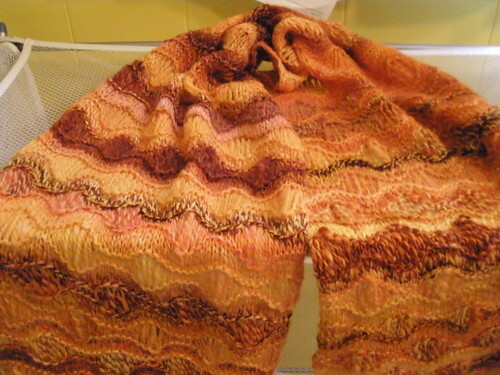 It was very nice to spin, though, and would make a nice outer sweater, not next-to-skin. This sample is not from the workshop but was given to me by a friend. 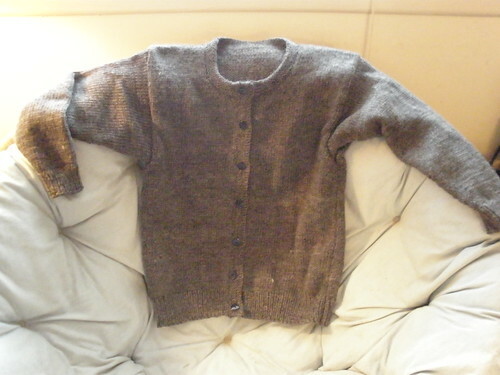 It's Gotland wool, native to New Zealand. 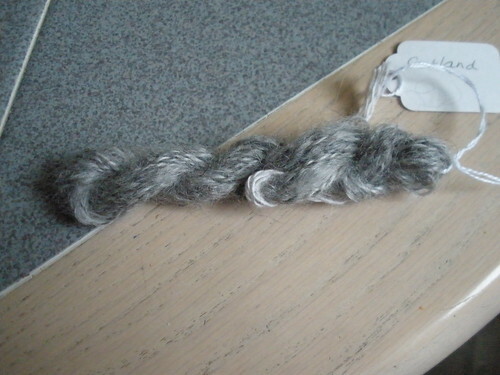 Gotland wool was used to weave the cloaks worn by the Fellowship in the Lord of the Rings movies. 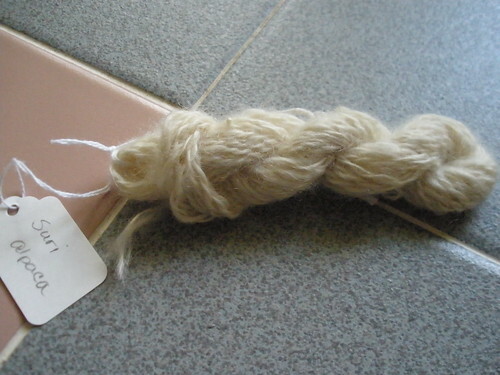 It's not very soft, either but has a beautiful sheen to it and I love spinning it. 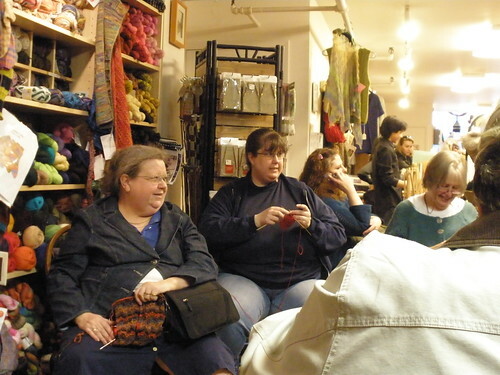 Yesterday, some of my Sunday knitting group took a field trip to the city. 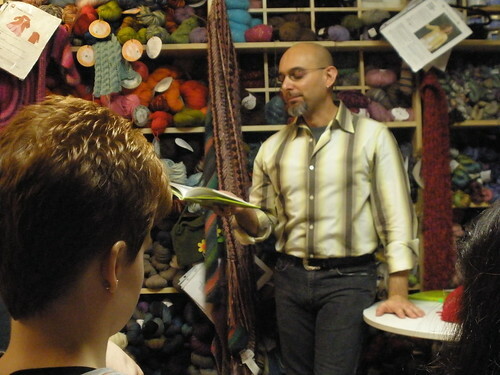 Franklin Habit was signing his book, It Itches at Knitty City. 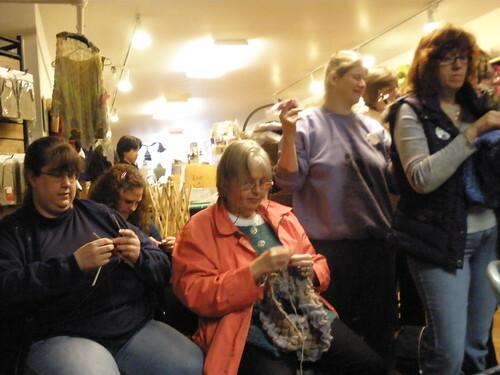 knitting and spinning away, of course. Lastly, here's a work in progress. 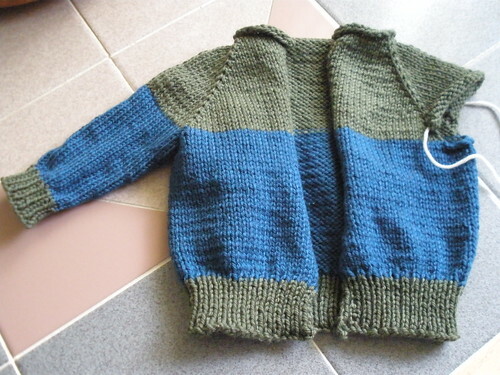 A baby sweater for my cousin's grandson. Cute! It looks like blue and gray but the gray is actually a nice olive green. 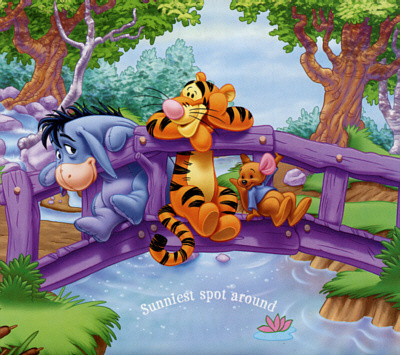 March is drawing to a close and, although spring is here, it's starting to feel warmer a little at a time. 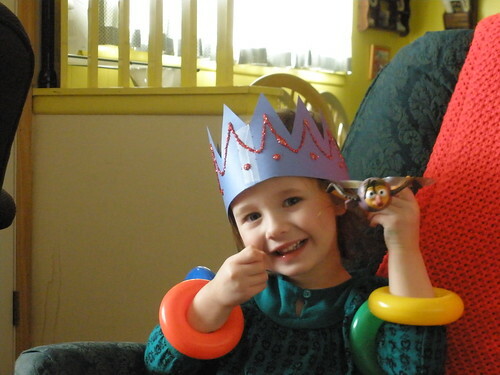 I have lots to keep me busy, crafting, Lorelai, teaching ASL class two nights a week. That's my life at the moment. It's the wearing of the green day, even though the Honigs had the corned beef and cabbage dinner last Saturday evening. Tonight's menu is chicken but I'll still be wearing my green and, if I get moving, I can make another soda bread, at least. So, let me see. What's new. Hmm. 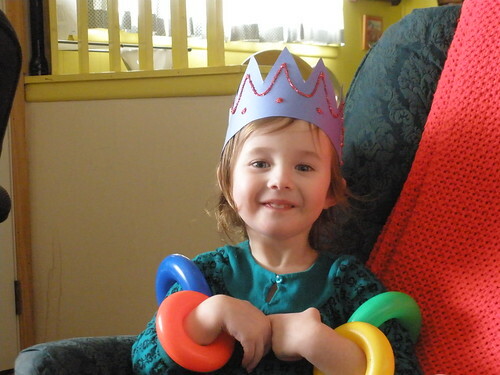 Some pictures of the lovely Lorelai. 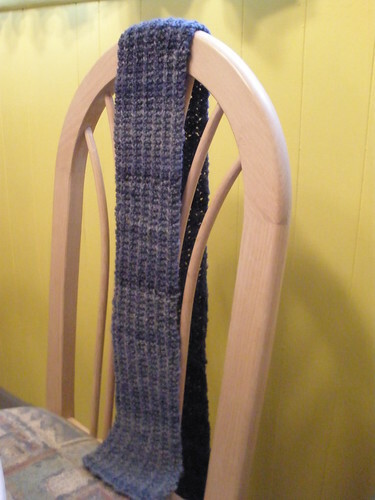 I finished the morning surf scarf. 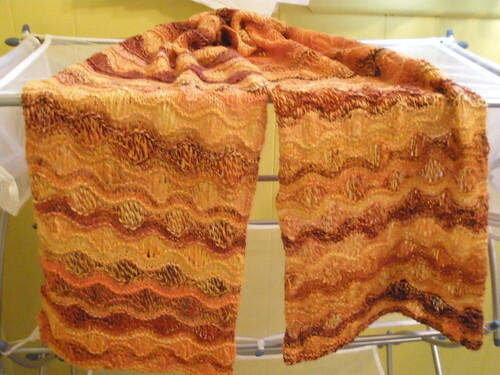 and made a cardigan on the knitting machine. 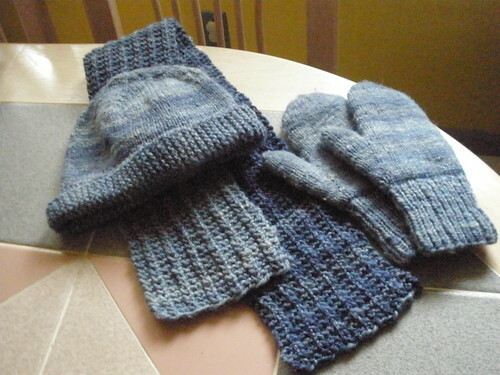 I knit a hat, scarf and mittens from handspun. I know there was something else I was going to say but...I'm having a senior moment, apparently.